سٹریٹ, گلی Rats. 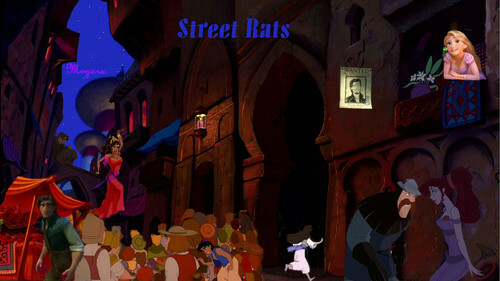 Esmeralda, Jim, Flynn, Aladdin, Sadira and Meg live on the streets and work cons together to get food and money. Read it here:. HD Wallpaper and background images in the disney crossover club tagged: disney fan fiction street rats jim esmeralda flynn aladdin meg rapunzel. This disney crossover photo contains سٹریٹ, شہر منظر, شہری ماحول, گلی, شہر ديکھا, and شہری سیٹنگ. There might also be بھورا پتھر, صف کے گھر, شہر گھر, صف گھر, and ٹاؤن ہاؤس. I read this story! Awesomeness! how dose Repunzel fit in the story? She comes in later and becomes friends with the Street Rats and Flynn's love interest. She'll actually be in the next chapter.